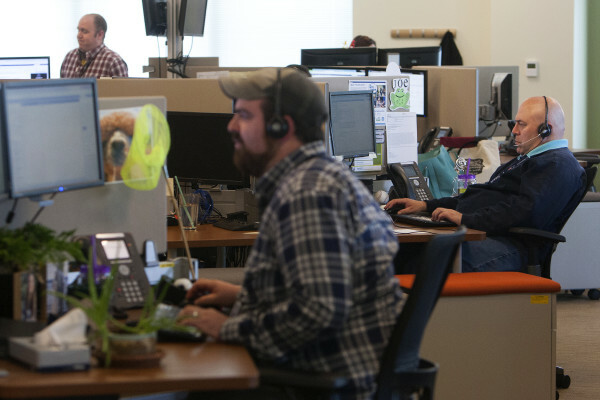 Athenahealth workers take calls at their office in Belfast Friday. 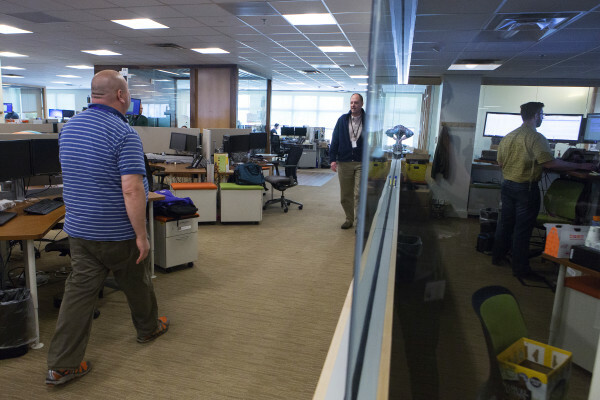 The Athenahealth offices are seen in Belfast Friday. BELFAST, Maine — When Maryland-based credit card lender MBNA came to Belfast about 20 years ago, it found a small Maine city still reeling from the loss of its chicken processing, sardine packing and shoemaking industries. The influx of credit card-generated paychecks, corporate largesse and a heady building spree seemingly changed the area overnight. When MBNA sold its holdings to Bank of America in 2006, the immense office buildings between routes 52 and 3 had been constructed to house all debt collectors and other call center workers — about 3,000 in total — faced an uncertain future. Now, those acres of climate-controlled cubicles are slowly finding other inhabitants, and that’s in large part because of the quality and care with which they were built, according to state and local officials. Bank of America employs about 800 people on the campus, with athenahealth employing nearly 900 in their buildings. Last week, Massachusetts-based OnProcess Technology announced it will be setting up shop in one of the vacant buildings. 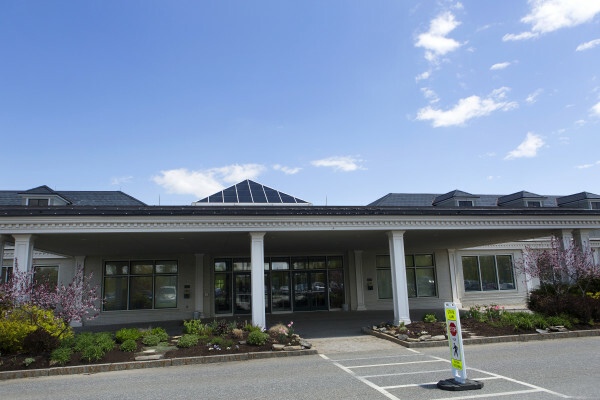 They will hire 50 workers right away, with the hope of expanding to 350 within the next two or three years, a company official told the Bangor Daily News on Monday. But they’re not in any big city. They’re in Belfast, population not quite 7,000, where a person might legitimately wonder if there’s a need for roughly 500,000 square feet of office space on a 143-acre campus. Charles Cawley, who co-founded MBNA in the early 1980s and brought the company to Maine in 1993, did not appear to have second thoughts about the Waldo County expansion, which local officials emphasized did not stop at office buildings. For instance, MBNA and Cawley brought the University of Maine to Belfast in 2000 by building the Hutchinson Center and leasing it to the university for $1 per year. The company also gave large sums of money to help local schools, to help construct the Waldo County YMCA and to renovate the Belfast Free Library. MBNA took the lead role in cleaning up an old chicken processing plant that long had been deteriorating on the city’s waterfront and turned it into Belfast Common, a popular park that hosts many summer festivals. They built Steamboat Landing Park and deeded it and the Belfast Boathouse to the city. And that’s just a partial list of what the company did in one city and county. At the height of MBNA’s Maine operations, it employed 4,500 people in Camden, Rockland, Fort Kent, Presque Isle, Farmington and Orono. Belfast City Planner Wayne Marshall said, in his opinion, the company’s biggest contribution to the state didn’t have to do with buildings but with the generous MBNA scholarships given to many Maine high school graduates over the years. “Without a doubt, the education and gifts transformed the state of Maine,” he said. The city councilor said the bricks-and-mortar office buildings, set in carefully landscaped acres and which gleam with glass, continue to help Belfast market itself to out-of-state firms. “If they hadn’t built those buildings, none of this would be happening,” he said of the advent of OnProcess Technology and the continued presence of Bank of America and athenahealth. David Tassoni at athenahealth. He is the company’s senior vice president of operations. David Tassoni, senior vice president of operations at athenahealth, said the company came to Belfast because of the available infrastructure and because of the people. 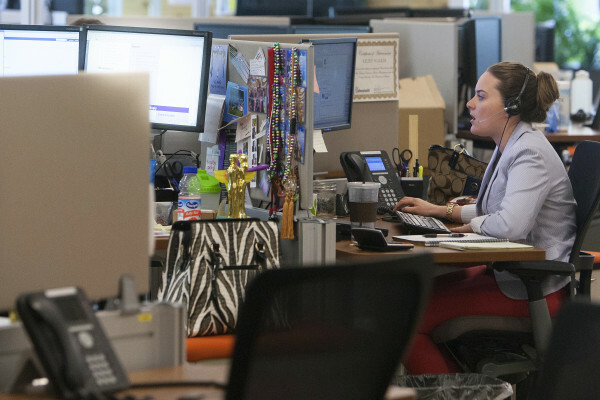 Many athenahealth workers had once been employed by MBNA. 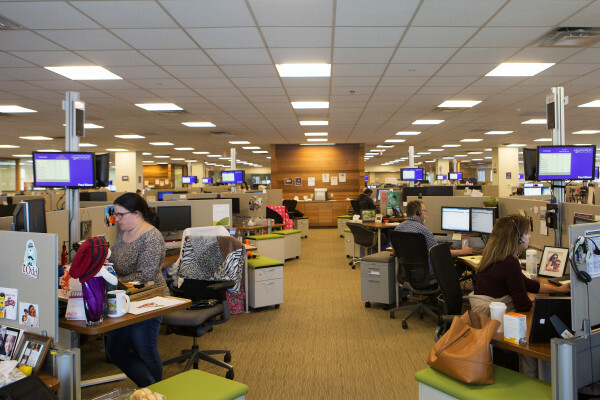 As during the MBNA days, workers come from far afield to work at athenahealth’s Belfast offices, which he describes as the company’s operations headquarters. Officials have held job fairs in Bangor to get the word out to a larger potential workforce, and he said that with a small local population, great buildings by themselves won’t be enough to build a good company. Correction: A previous version of this story said David Tassoni was executive vice president and chief operating officer. His title is senior vice president of operations.